Communicating effectively in an emergency situation comes down to several factors: having good policies and procedures in place, being able to react quickly with appropriate information, and having the right tools for the job. Emergency situations can take many forms – it could be a natural disaster like an earthquake or a flood, a building fire, a terrorist attack or an active shooter situation. Being prepared for a range of scenarios will help you be on the front-foot should one actually occur. When an emergency situation develops, you often have little-to-no warning that it is about to happen. The safety of your employees and the security of your business is at stake, meaning you need to be able to respond swiftly as time is critical. Therefore it is important that you ensure your communications delivery method is high-performing and has the ability to reach the most amount of people possible in a short amount of time. 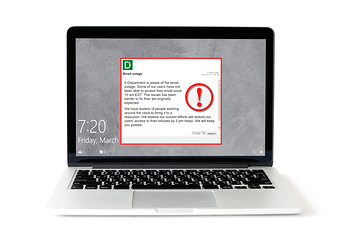 A proven and effective emergency communications channel is DeskAlerts. It is a powerful internal communications tool that allows you to send messages in the form of a pop-up window to the screens of employees. They will receive the message no matter what other programs they are using at the time, an the message cannot be skipped or ignored. DeskAlerts has an uncomplicated user interface and anyone, regardless of their level of technical ability, can quickly and easily send messages with it. In an emergency where there is little time to spare, this feature is vital. Sending an email out in an emergency situation just isn’t going to cut it. You are relying on staff looking at their inboxes when a crisis hits, which is a completely hit and miss strategy. There’s no point in reading an email several hours later when you needed them to act straight away. Added to that, email is now an unreliable communications method in general: many emails are never opened as workers are burdened with cluttered inboxes. DeskAlerts allows you to communicate instantly and in real time. DeskAlerts has a statistics module that shows which of your staff members have seen the messages and which ones haven’t. One of the useful aspects of this is that you can follow up with staff who haven’t seen the messages directly to check on their welfare. If your company spans different geographic locations, sending an emergency warning about a situation in a specific location to your entire workforce isn’t going to be appropriate. DeskAlerts allows you to send to custom, niche audiences so only those affected would receive the notifications. You can send the rest of your workforce an alert advising that there is a situation affecting one of your offices and that communication and staff availability will be affected for the duration.